Sigma CEO Kazuto Yamaki was recently interviewed by Dave Etchells at the CP+ 2016 show in Yokohama, Japan. My readers know I am rather impressed by the lens offering from this company, especially the Art line and the recently announced 50-100mm f/1.8 lens. I have been a user of Sigma's lens for many years now but not a big buyer of their glass because I am waiting for Canon to release new models before deciding on new, niche purchase for my equipment bag. Dave Etchells : We’re really surprised and excited by your new mirrorless cameras. That was a big surprise. We had no idea you were working on them, and they’ve generated a lot of interest and debate with our readers. Can you give us some background on why you decided to get into the mirrorless market? Kazuto Yamaki : I was also surprised at the response from the customers. Actually, it was quite a natural decision for us, because when we started the project we discussed what the camera for the next generation should be. And we discussed what is the advantage of [our cameras]. And of course, it’s the Foveon X3 sensor. It’s a very sharp image, and very crisp per-pixel. A small focus error in the image would be very visible, though, because the sharpness per pixel is quite high for our camera. So there are many advantages [for a mirrorless camera over a DSLR]. The [lower] focus accuracy and mirror shock [of a DSLR], does not exist in the mirrorless system. So we decided to go to mirrorless. DE: And with the sd Quattro H, we haven't seen a camera with an APS-H sensor for a long while, since the Canon 1D Mark IV. Why was it that you went that route, rather than a full-frame sensor? Is it still difficult to scale Foveon all the way to full-frame, or...? KY: We thought that if we go to full-frame, the file size would be huge and the processing speed would be very slow. So we thought that APS-H is a good size for the customers. DE: A good compromise, yeah. You make APS-C and full-frame lenses. Will your APS-C lenses actually have enough image circle to also cover APS-H? KY: Basically, you cannot use the same lens for APS-C to APS-H. There might be some exceptions, but our official statement is that we cannot. The Sigma sd Quattro H is the first camera we've seen in years to feature an APS-H sized sensor. DE: So it’s really full-frame lenses only. Can we discuss the tradeoffs in going with the existing SA lens mount, versus one with a flange-back distance that's been optimized for mirrorless cameras? 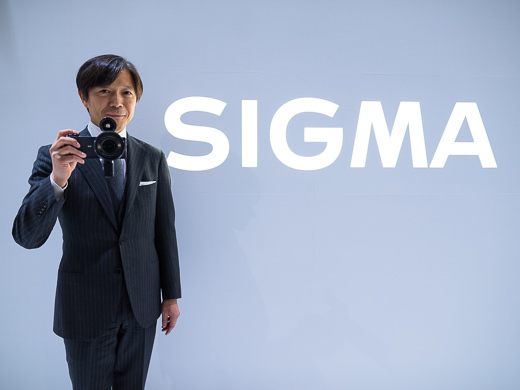 I mean, we realize that a new Sigma camera needs to be natively compatible with Sigma's SA lenses, but would an adapter approach have allowed you to develop smaller lenses for the system in the future, that would still be compatible? Or is it more that the oblique angle required by the short flange-back distance isn't compatible with a stacked sensor design like the Foveon technology? If you have a three-dimensional structure on the chip and you have a very short flange-back distance, unless the lens has been designed to be telecentric, you can end up with shading or color problems, or whatever. What can you say generally about the decision to go with the SA-mount? KY: We simply wanted to support our existing customers. They use SA lenses, so we needed to develop a camera that an existing customer can use as-is. DE: Ah. How does the flange distance on the SA-mount compare to other mounts like Canon or Nikon? DE: So maybe there's not room to put in an adapter to run, say, a Nikon lens on it? I'm thinking in terms of the adapters, like Canon's EF-mount has a fairly shallow flange distance, so you can put an adapter on it and then use a Nikon lens. I was wondering if the SA-mount is shallow enough that there's room for an adapter? KY: Yes. Physically, it's possible. The Sigma SA-mount has a flange distance of 44 millimeters, identical to that of Canon's EF-mount. DE: Ah, OK, good to know. High ISO sensitivity has always been a challenge for Foveon sensors in the past. Is that an area that these new sd Quattro cameras address, with the bigger sensor being better for you? Does the larger sensor do better on low-light and high ISO shooting? Or you did you give it more pixels, so it has the same pixel size? KY: It has the same pixel size, so it is the same. But for the sd Quattro we changed some algorithms in the image processing, so we could improve the high ISO performance, by maybe about one stop. DE: Ah, about one stop - and that's as a result of processing, as opposed to sensor design. The Sigma 50-100mm F1.8 DC HSM | Art lens aims to pair the image quality of a prime-lens with the versatility of a zoom-lens. KY: Yes. But I know some customers like our f/1.8 zoom series, including some videographers. Because most of the videos use the small crop sensor, a format they call "Super 35", which is similar to APS-C.
DE: Yes, "Super 35" is very close to APS-C.
KY: So we'd like to expand this series, but it's quite challenging, so we are not sure if we can develop another lens. DE: They're difficult designs to execute. KY: Actually, it's a matter of the mechanical construction. If there was more flexibility in terms of mechanical construction, we could probably make any kind of lens, but if we make a lens for a system camera, there's a mechanical limitation for the diameter of the mount, and many other limitations. So this makes it difficult to develop f/1.8 zoom lenses. DE: Ah; it's a lot about your restrictions for the mount and that sort of thing. I know in the case of the 50-100mm, talking to the engineer who designed it, that with the floating focus elements, the requirements for the actuating cam were very, very constrained. It has to be extremely precise in its motion, so that was a challenge for him. In the quest for image quality, Sigma's 20mm F1.4 DG HSM | A lens relies on two FLD, five SLD and two aspheric elements, including a huge 59mm double aspheric. DE: And also, those lenses use a lot of very sophisticated glass. For instance, the 20mm uses lots of aspherics and lots of FLD and SLD glass, and then in the teles, there are no aspherics, but even more SLD and FLD. So do you see with the f/1.8's going to longer focal lengths, isn't that where the demand is? KY: It's quite challenging, because the lens gets so big. DE: Yes, I can see that. Actually, I'm surprised that the 50-100mm isn't bigger than it is. I mean, you said it was about the same size as a 70-200mm f/2.8, give or take. It's actually a little bit smaller, I think. KY: Yes, because we wanted to achieve very high image quality. We applied the same concept as for the 18-35mm f/1.8. KY: The zoom range is very short, only about two times. The concept is that each focal length has optical performance equivalent to prime lenses. That's the concept. KY: So that's the first priority of the concept of the product, so that makes it bulkier and heavier. The Sigma 18-35mm F1.8 DC HSM is the world's first f/1.8 constant aperture zoom lens. DE: Yeah, that came out in the presentations. Some people might look at a zoom lens with such a short ratio and say, "Well, why bother?" But really it's giving you a 50mm f/1.8, a 75mm f/1.8, an 85mm f/1.8, and a 100mm f/1.8, so all of the standard medium focal-length primes are covered by just one lens. DE: Also, they showed me an MTF chart that compared it to an 85mm f/1.4, I think it was, and it was just amazing. I mean, OK, it's a little bit smaller aperture, but it was so much sharper up to the edges. KY: Actually, I wanted to price a bit higher because the manufacturing cost is so high. KY: But those whom still use the APS-C sized camera, they have a limited budget, because the price of the camera body is low compared to full-frame, so the lens should be close to that. Sigma's sd Quattro-series cameras debut a new hybrid autofocus system pairing both phase and contrast detection. Both nine-point and free-move focus modes are available. Let's see, so the new sd Quattros have a hybrid AF system, which we presume was developed with attention to performance with lenses that weren't optimized for contrast-detect AF. Do you have any sense of what kind of AF performance we can expect? Will it be comparable to existing mirrorless cameras from companies like Sony, Olympus or Panasonic? And will older HSM lenses still autofocus well, or do you recommend newer models with current focusing-motor technology? That's a very long question there; I guess the short version is, you have a hybrid autofocus system now. Is that primarily to assist with older-design lenses that aren't suited for contrast-detect? KY: The camera has to support the lenses which were developed for the DSLR, so if we only have a contrast AF, the focus speed will be very slow. So we needed to have phase-detection, yes. DE: It's the latter, it uses both all the time? DE: We're curious about the hybrid AF system and a bit more detail on it. For example, there are nine selectable AF points, but then there's also a free-movement AF point. Does that mean that there are many more phase-detect pixels on the sensor than just nine sites? KY: I think we have more. DE: You have more, so, yeah. Because it seems like -- and I haven't had a chance to look at it myself yet -- but it seems like you can move this other focus point around. So you probably have a wide array of them that you can just pick some. KY: Sorry, I don't know. DE: Another related question for the engineers: If there are additional phase-detect pixels that aren't part of the normal points, do some of those get used during continuous autofocus, if it's tracking a subject or not? Or is it just always those fixed points? DE: Yes, the first camera for you that has on-chip phase-detect. Were there any specific factors that you needed to take into consideration, to do phase-detect on a Foveon sensor, as opposed to conventional CMOS? Was there anything different about how you had to implement it? KY: It's basically the same. DE: And so this is really a completely new sensor for you. The APS-C sensor in the dp Quattro series did not have any phase-detect at all. DE: So it's not that they were they there before but just weren't used. Overall, though, it sounds like that the basic sensor architecture is the same, that the change in ISO is just the processing, so your unit cell in the chip is pretty much the same. KY: The pixel architecture is the same. DE: I guess if you had any, you would have said so, but do you have any estimates on pricing or availability for your mirrorless camera yet? KY: I have not decided yet. KY: The sd Quattro will be probably sometime in the early summer. The Quattro H will maybe be in the autumn time-frame. Sigma's PG-41 Power Grip accessory for the sd Quattro-series cameras will triple battery life, thanks to its provision for not one but two extra batteries beyond that in the camera itself. KY: Compared to the other companies' battery life, probably [it will] be shorter [per pack], but we're still working on the firmware, so we still don't know. DE: As, so you may be able to reduce the power consumption. And would the sd Quattro with the three batteries be similar to an SLR with just one? DE: I haven't actually had a chance to handle the cameras out on the booth yet, but there was a question about why the EVF was placed where it was, centrally as opposed to on one side. Because some people like the viewfinder on the side, so their nose doesn't hit the screen. DE: But then maybe other people are used to having them in the middle on SLRs. Did you give some thought to where the viewfinder would go, and was there a discussion over it, or was it just kind of "We'll put it in the middle like the SLRs"? Sigma's 30mm f/1.4 DN lens is the first f/1.4 optic designed for Micro Four Thirds and Sony E-mount cameras. DE: And so will we be likely to see more of that, where you'll take, you know, an APS-C design and give it a Micro Four Thirds mount? DE: That makes a lot of sense. KY: Yeah. If we can increase the sales volume, we can reduce the cost, and we can provide the products which the customers want. DE: Yeah, so if you had to design one just for Micro Four Thirds, the volume would be too low, so it would get too expensive. DE: That makes perfect sense. What was the reason behind offering the new sd Quattro with two different sensor sizes, rather than only selling the larger one? And a follow-on question to that is which model do you expect to sell more of eventually? KY: Ah, I'm still not sure, but the APS-H version, the file size is huge, and the processing speed [comparatively] slow, so we still believe that the normal APS-C size will be a kind of standard model. KY: Yeah, at the cost of the processing speed or file size, they should choose APS-H. But we feel we cannot recommend the APS-H camera to [just] anybody. DE: ...because of those reasons, that it's slower and the file size is so big. And if that were your only model, people would be saying "Oh, it's so slow", or "the files are too big"
The Sigma sd Quattro-series cameras have an unusual side-by-side monitor arrangement with both a 3.0-inch main display and a secondary LCD info display to its right. DE: The follow-up question is how production will be allocated between the two models. I imagine the answer is "We don't know yet, because we don't know what demand will be." The sd Quattro H has a very interesting dual-monitor arrangement. Was the dual monitor feature something intended for the sd Quattro series from the beginning, or was that added later in the development?" KY: When we're working on the body design, we decided [to implement that feature]. DE: You decided at that point, yeah. KY: Probably at a very early stage. DE: And then there's, as always, the standard question about video... As with other recent Sigmas, the sd Quattros do not record video. Is that as a result of the Foveon X3 sensors? Are there technical limitations that do not allow these cameras to record video? And moving forward, do you think that at some point there will be a video capability? I'm guessing the main thing with the video is that it's so complicated to do the processing for the color separation, right? You've got to try to do that on the fly? KY: No, mainly the issue is the data output speed. DE: Oh, readout from the sensor. KY: Readout, yes, because we have the three-layer stack, so the data size is about two times or three times [as much as a traditional sensor]. DE: OK, so it takes two or three times longer to read out. KY: We could make super-fast readout performance, but in this case we'd have to sacrifice other features, like [having a lower] pixel count or something. KY: So we set our target customer as the still photographer. We cannot implement many things, because we have to develop our own sensor, and we have to develop the processor, so we have to carefully select the target customers, and implement the features which will be most useful to them. DE: Yes, you have to pick your shots. If you tried to do video, then other areas would suffer, so you chose to focus on still photography. DE: Changing topics again, the 50-100mm is shipping in... April, is it? DE: April, so coming up soon. And the 20mm f/1.4 has been shipping for a while? KY: Yeah, it's available in the market. DE: And how is that selling, is that being well-received? DE: It's a little more of a special-case kind of lens than something like a 30mm, the 30mm is a more accessible focal length for people. DE: Yes, when you get to a certain point with wide-angle, it really changes how you compose images. 35mm is easy, 30mm takes a little more thought, but really wide angles take a very different approach. I know, I've done very little wide-angle shooting and I just have to think completely differently to compose well with a super-wide lens. DE: Well, I think that covered all the questions I had for you. Thanks again for your time, you're always a very interesting interview subject, for myself and our readers as well, I think!